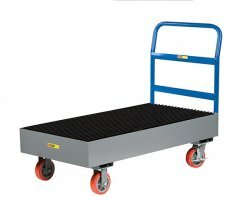 Model:SSB-5125-6PYBK Spill Control Cart Size 26"W x 51"L x 14"H 6" Polyurethane casters (2) Rigid, (2) Swivel with Wheel Brakes Durable welded steel construction â€“ stronger than plastic and non-combustible. 33 gallon capacity sump has removable steel bar grating deck for easy clean-ups. Chemical resistant 6" polyurethane casters, 2 rigid and 2 swivel with wheel brakes to help prevent unwanted movement. Removable pipe handle with cross brace extends 25" above top of sump.